The most advanced protein composition, which are necessary for the proper functioning of the living organism, and which play a particularly important role in the nutrition of athletes. 180 loyalty points Your cart will total 180 points that can be converted into a voucher of 7,20 PLN. FA Titanium Pro Plex 7 has revolutionized the market for high-protein nutrients in its composition and almost perfect rendition of taste. It was not yet so refined product whose price but remains at a low level. Let's face it, they should pay extra few pounds to gain so valuable supplement. 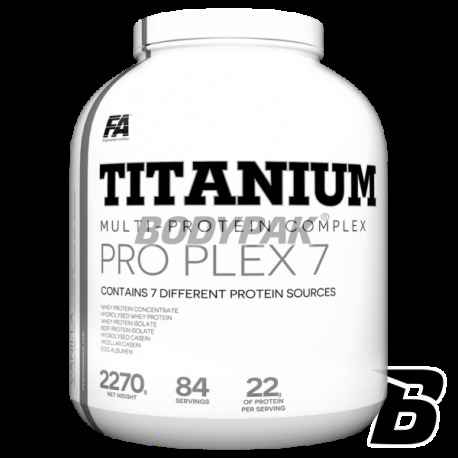 Titanium FA Plex Pro 7 is the most powerful protein composition, which are necessary for the proper functioning of the living organism, and which play a particularly important role in the nutrition of athletes. 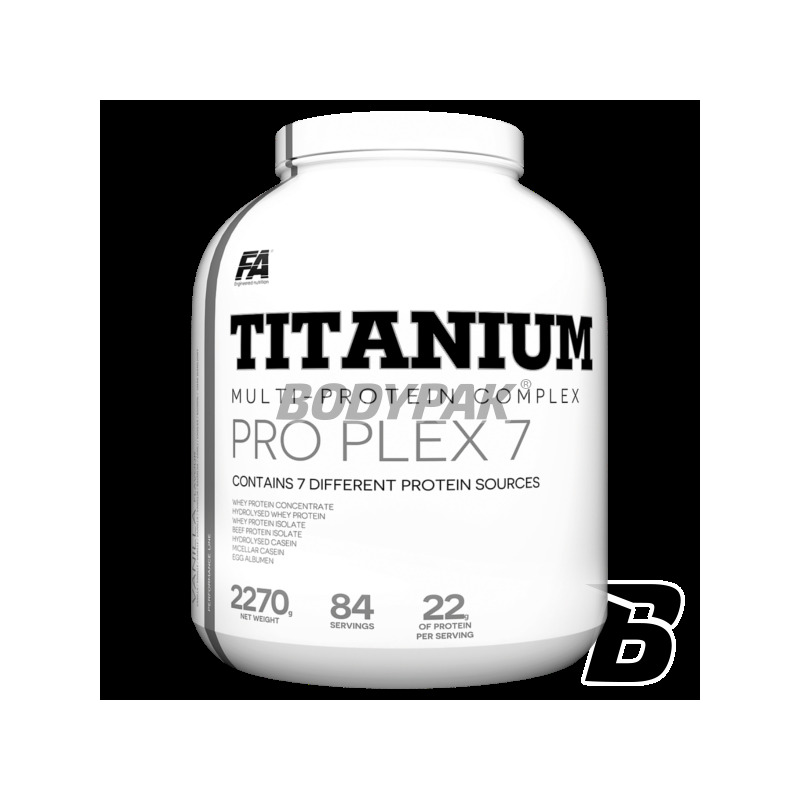 The proteins contained in the titanium Plex Pro 7 is provided with Carbelac® whey protein concentrate, whey protein isolate Isolac®, whey protein hydrolyzate Optipep ™, micellar casein, hydrolyzed casein PeptoPro®, egg white albumin and soy protein isolate and veal. All of these types of proteins have a different structure and characteristics, they have different amino acid composition and varying the rate of etching, and hence at different times are absorbed by the body. As protein hydrolysates which have been subjected to etching process are characterized by a high proportion of peptides and free amino acids that the body can be used immediately on ingestion without digestion. In contrast to the amino acids from hydrolysates - casein, which is long and slowly digestible and even in a few hours after eating provides the body with essential amino acids to build muscle, which makes it an ideal protein for the night. Isolate as the most concentrated source of protein provides protein cleaned and most concentrated. Bovine protein has a different amino acid profile of whey and is therefore an ideal complement to the product not only protein amino acids, but also supplies necessary to produce collagen hydroksyaminokwasy. Due to such a large variety of sources of amino acids Titanium Pro Plex 7 is the ideal composition for all active lifestyles, athletes, bodybuilders and all who care about delivering a body protein that contributes to the growth and maintenance of muscle mass and also helps to maintain healthy bones. HIGH QUALITY FOR LOW PRICE! INVEST IN THE BEST PRODUCT ON THE MARKET! Składniki: premiks białkowy [koncentrat białka serwatkowego Carbelac®, hydrolizowany izolat białka wołowego, izolat białka serwatkowego Isolac®, micelarna kazeina (z mleka), albumina jaj kurzych, hydrolizowany koncentrat białka serwatkowego Optipep™, hydrolizowana kazeina PeptoPro® (z mleka)], kakao1, aromaty, substancja zagęszczająca (guma ksantanowa), barwnik (czerwień buraczana)2, substancja słodząca (sukraloza), barwnik (beta-karoten)3 . Dotyczy produktu o smaku: Czekoladowy1, Truskawkowy2, Waniliowy3. Nie wiem dlaczego kiedyś porzuciłam kazeinę na rzecz wpc i wpi. Ta odżywka przekonała mnie z powrotem do kazeiny, a raczej jej matrixu z białkiem serwatkowym (dodatek albuminy to dodatkowy plus). Bardzo dobra rozpuszczalność i smak (waniliowy b.dobry, czekoladowy mega :)). Nawet dodatek białka wołowego nie powoduje że konsystencja jest glutowata (tak jest niestety w przypadku Shake it - matrixu z Realpharmu). Plus żadnych sensacji żołądkowych. Cena - jak na jakość ok. Ogólnie bardzo uniwersalna odżywka; na pewno jeszcze kupię.